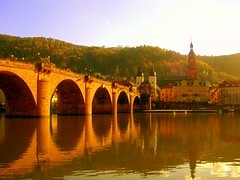 The word finally came, and we’re going to be moving to Heidelberg. It’s a relief to finally know (and totally excellent that we got our first choice), but my first thought was, “Holy crap, we’re moving to Germany. What were we thinking?” That passed quickly, though, and now I just want to head to the library and pick up some more German language CDs. We don’t really have any firm details yet as to where exactly we’ll live or when exactly we’ll be moving, but now we can at least start getting ready. Anyone want to buy a house in Tacoma? This was written by Mike. Posted on Thursday, March 6, 2008, at 10:04 am. Filed under Germany. Tagged Germany, heidelberg, Moving. Bookmark the permalink. Follow comments here with the RSS feed. Post a comment or leave a trackback.